Disappointments. Not a very catchy, interesting title, is it? Not even encouraging! But disappointments are universal. We all have them in one form or another, nearly every day. At my age, I’ve had enough serious disappointments that I now count my blessings when my disappointments are more along the line of a bad hair day, getting a cold, missing a fun day with friends, or not getting in on a great sale. Disappointments related to Aaron usually come in two varieties. We are either disappointed IN Aaron for some reason, or we are disappointed FOR Aaron. We are usually disappointed IN Aaron because of his behaviors. We are usually disappointed FOR Aaron because of something that hurts his heart, and therefore ours as well. On November 6, two days before his birthday, I was going to take Aaron to one of Paradigm’s residential homes so that we could celebrate with some of his friends. We were going to take pizzas and have fun. Aaron was so looking forward to it! But he came down with a stomach virus and was unable to go. How disappointing! We were disappointed for Aaron, very much. So a week later, this past Friday, we made the same plans again. But on Friday afternoon, the plans were canceled once again. One of Aaron’s friends was having a very rough day and it wouldn’t have been a good situation for us to be in the home that night, no matter how much pizza we brought. It was going to take time for this person to calm down. In fact, this client had some words for Aaron during the situation, much like Aaron does when he has a meltdown, and it really hurt Aaron’s heart. And it hurt and disappointed us, too, for Aaron. All of this made Aaron act out. He banged on the car that brings him home, making a small dent in the front of the car. He yelled at me when he got home, escalating as I tried to talk to him. He looked in his Friday goodie bag that sat on the kitchen table, and then knocked it on to the floor. This is Aaron’s way of handling his own disappointments. Instead of talking about his hurt, he becomes angry. Talking only makes him angrier, especially my talking to him. I had two disappointments going on that evening. I had my disappointment for Aaron as I was hurt for him in his hurt. And I had my disappointment in Aaron…..in his behaviors that can’t be allowed, but sometimes can’t be stopped. His defiance was understandable but unacceptable. I hid his goodie bag from him as a tangible sign that his behavior was wrong…..and I wished with all my heart that he could just verbalize his disappointment instead of acting it out with harsh words and defiant behavior. He finally settled down enough to show an interest in going out to eat dinner instead of yelling, “NO!” as he had earlier. So before long we met Gary at Outback, where we enjoyed dinner together and especially enjoyed seeing happy Aaron return. In fact, before we left the house to meet Gary, Aaron said, “I’m just disappointed.” Wow!! Victory in three little words! Aaron expressed his disappointment verbally and I praised him for that as I told him that I understood, and that I shared his disappointment. I shared it so much that I even watched The Blob movie with him that night. That movie brought me to a whole other level of disappointment, trust me. It was painful!! But Aaron was happy! He had a rough morning yesterday, Monday, as he returned to Paradigm. But the afternoon was much better. Today he got up very early, and at 6:11 I was in the kitchen listening to him talk about The Blob movie that we had watched. I’m sorry, but 6:11 is a little early to be handling talk about The Blob. I’m still not over that movie. Our morning went well, and I was happy for Aaron to be so happy as I dropped him off at Paradigm. But shortly before 2:30 I got a call. Aaron was having a seizure. I had just gotten home from spending the day with my elderly friend, so I was thankful that I was free as I drove to pick Aaron up at his day group. Poor Aaron! Another disappointment, this time more for me. Disappointment for Aaron as he faces these awful seizures……his badly bitten tongue…..his headache…..the interruption in what should have been a good day. He handles it so well, thankfully unaware of how sad I am for him. Simple words, but I knew they were somehow for me today. 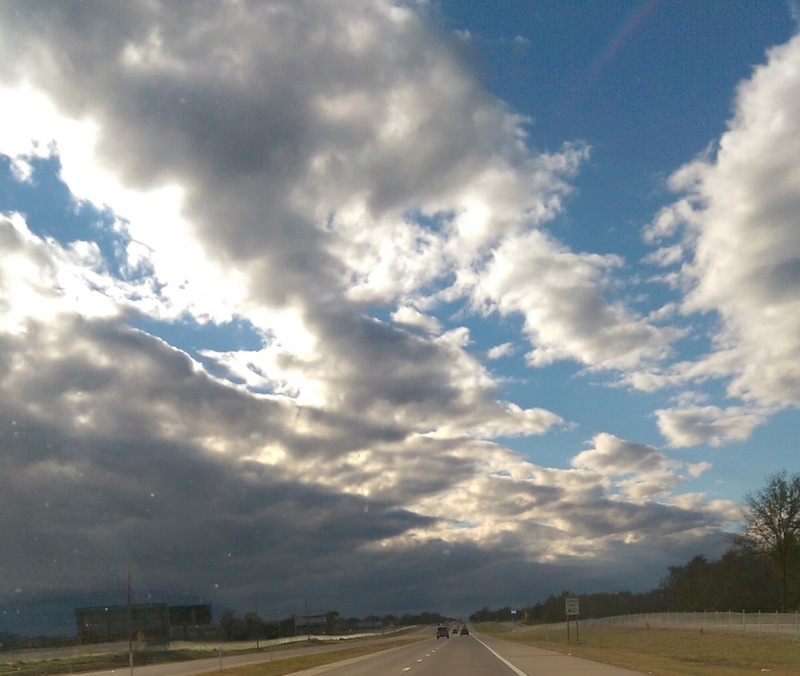 As I drove home with Aaron beside me, his breathing having that certain post-seizure sound, I looked up at the sky as very dark clouds rolled in. There was a mix of bright blue, but coming in were the dark stormy clouds that promised rain. Our day was changing from bright sunshine to dark cloudiness, just like my day with Aaron had gone from bright happiness to dark seizure concerns. Disappointments. Changes. We face so many of those, don’t we? And I didn’t wonder anymore why God gave me that random verse this morning in the little book of Malachi. “For I, the Lord, do not change.” So in the middle of disappointments, whatever they may be…..and in the middle of the changes that those disappointments often bring…..we can as God’s children stand firm in God’s promise that He does not change. Ever. Just stop and think about what that promise means. God never changes. He is always the same, loving us and instructing us and being there for us. No amount of world changes, of family changes, of my own changes….and the disappointments they bring….will ever change God. I’m very, very thankful for that promise today. I’m very thankful that God gave it to me…..humbled, really, as I always am when God speaks to me so kindly and specifically. One more thing. I’m never disappointed in God. Never. And I know that He will see us through all of our disappointments, including the ones IN and FOR our Aaron.